Beautifully designed and programmed Adobe Captivate templates, Articulate Storyline templates and Trivantis Lectora templates, grouped together in one large template library consisting of more than 1400 e-learning templates. FasterCourse started when we understood the need for Modern Design e-learning templates. The templates available on the market often had a bit oldschool design and we wanted to bring some fresh spark in the industry. Currently we have more than 1400 templates available for Storyline, Captivate and Lectora, it is an all you need template library available as a subscription. We are constantly adding new templates to the library, and recently we also added character images, which you can use in your e-learning courses. Our Gustav's trip template, won the best template of the year in Lectora User Conference 2016 in Fort Lauderdale Florida. We also offer custom development services for custom branded template development as well as course production. We are a team of 8 people, all our support work is done by people who created the templates, so you can be sure about very personalized support. 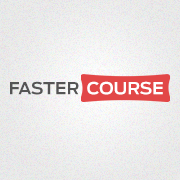 Discover the Solutions Fastercourse has to offer.